Today, we welcome Julie Couch, owner of Julie Couch Interiors (design firm and retail shop) and author of decoratordozen, a design blog. Get that Pin it button ready–you’re about to be inspired as she takes us on a walk-though of her beautiful home! Thank you, SB, for the chance to write for you today and share my home with you! When I meet someone new and they find out I’m an interior designer, they typically make a comment like, “I bet your home is perfect!,” or “What’s your style?” The truth is my home looks fabulous … when I have a party or guests coming over for dinner (or, in this case, a photo shoot). But just like everyone else, on a daily basis my house has laundry baskets and baby toys scattered all over the place! And as far as my design style goes, I’m still figuring it out for myself! I definitely don’t have a standard “look” that I recreate for clients. Each person my designers and I work with is unique, and every home should reflect that uniqueness and personality. So welcome to my home–come on in and look around! The vintage runner may be a splurge, but the tall, skinny side chairs were a quirky garage sale find that I painted and reupholstered. We loved the drama of the heavy door and think it adds a little age to a new home. 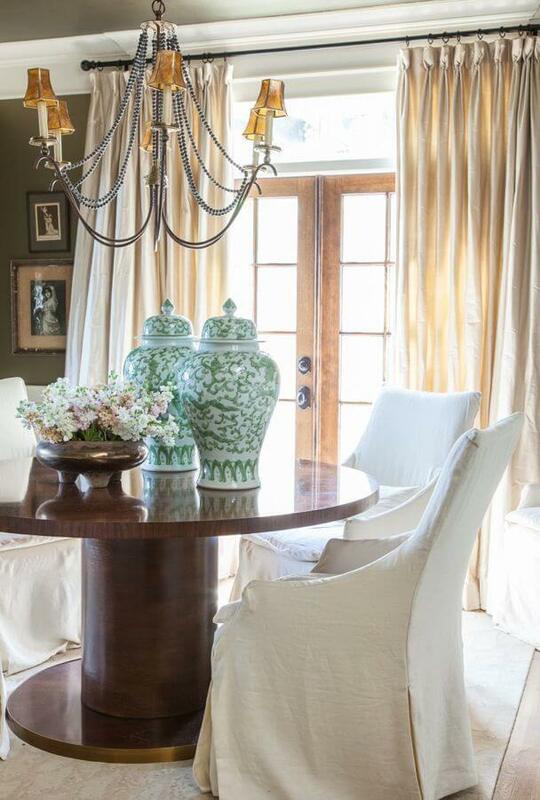 Simple ivory linen drapery works in almost any space, no matter how traditional or modern. It provides softness and balances more masculine elements like this brick fireplace and wood mantel. The raffia ottomans also work well as an impromptu changing table for a chubby seven month old. Our family room is where we spend most of our time. In our case, this is where the ExerSaucer and Bumbo seat also reside. The baby paraphernalia was removed for this photo so you’d be more impressed! We try to keep fresh flowers or a seasonal plant, but usually they get a little brown before replacements arrive. Flowers simply make any space more beautiful. No decorative accessory can ever compete with lush blooms in great vases. If I were super wealthy, I would have fresh flowers delivered to my doorstep every week. I would also have a full-time chef and makeup artist, but I digress …. And if you stay overnight, this is where you’ll sleep. The lamp was a junk store find for six dollars, but to be totally honest, I then spent a couple hundred dollars to have it rewired, shaded, etc. But doesn’t it sound cool to say it cost six dollars?! The rug is old, yet vibrant, and the French chest I bought from a friend who was redecorating. My favorite painting, by Julia Martin, was my first big art purchase, and I’ve not regretted it for one moment since. The color palette is stunning, and it works perfectly with my collection of vintage aqua stoneware. I like the custom headboard’s horseshoe shape as a subtle symbol of good luck for our guests. The walls and bedding are neutral, but the aqua floral and gold velvet pillows add a little whimsy. Dark chests with an intricate drawer style complement glamourous mercury glass lamps. My mom gave this mirror to me after I asked her a dozen times if she had a place to use it. I think she got the hint! The lamp and angel picture are antique. The chest I bought and immediately painted because I loved the hardware. A painting by Alicia Chatham hangs above an antique French chair which was recovered in the very popular but still fabulous imperial trellis pattern in charcoal and ivory. Our living room has lots of seating. My husband, Mark, jokes that I collect old chairs. This incredible painting by Christina Baker brings the room to life. Her use of color is breathtaking. Ok, so I admit that I felt pretty chic when I ordered this chaise. I’d always wanted one and wasn’t even sure where it would work in my house. But it turns out that I love it with this somewhat formal cabinet and my favorite “church chair,” as I call it. The mix of old, new, and unexpected is my favorite recipe for a great space. This chair isn’t an “important” antique, but I love the patina. I changed the upholstery to ivory linen but didn’t touch the wood finish. Sentimental handprints hang above a marble table that holds vintage Italian crosses, but the white resin lamp keeps it from being too “serious.” The tiny wooden shoes just made me smile, so I brought them home to rest on a stack of design books. In our master bedroom, I chose feminine bedding and a John Robshaw block print for my headboard and 1960’s settee. Even though I designed the bed myself, after six years, I still love it! The antiqued mirrored side tables feel glamourous and are unexpected with the more casual fabrics. Small pieces of art above bedside tables make bedrooms feel more intimate and bring the scale down in larger spaces. Large green and white ginger jars were added this summer. They wake up the soft palette, keeping the dining room fresh and pretty. Chairs are simple linen and the drapery is pinstriped silk. The gold band on the base of the table is my favorite detail in the room. A velvet greek key lumbar pillow and scalloped iron mirror add interest. Old trunks are storage and an antique pharmacy table serves as a desk in our home office. Woven ivory leather seats and a capiz pendant are simple but striking details in this small space. Black and white photography is updated with a lucite frame. The desk lamp mixes metals and wood tones well. A very tall ladder back chair looks modern next to the traditional campaign style secretary. Architectural drawings add to the neutral scheme, but the smoky glass lamp keeps it young. Our landing has enough space for a generous seating area with a pair of oversized, slipcovered chairs with beaded pillows. Funky gold finds from an antique store sit just below a peaceful painting by Kim Thomas. And finally, the newest room in our home for the newest addition to our family is full of bright colors and handmade art. The slipcovered chair and ottoman are practical and the Lulu Dk fabric is precious. A pair of giraffe sconces hang above a repurposed chest turned changing table with the addition of a simple top. The gorgeous painting is by Erin McIntosh, and I can promise it looks just as pretty at 3 a.m. Thank you for taking a little tour with me through my home. I hope you found some ideas and inspiration for your own unique home sweet home! Thanks so much, Julie. Is this weekend too soon to come for a visit?! To learn more about Julie Couch Interiors, to follow Julie’s blog and for more information on her retail store, located on 8th Avenue, visit her website: www.juliecouch.com. Today’s photos are by Nashville-based photographer Caroline Allison.